Spice World is a 1997 British/American musical comedy written by Kim Fuller and Jamie Curtis. 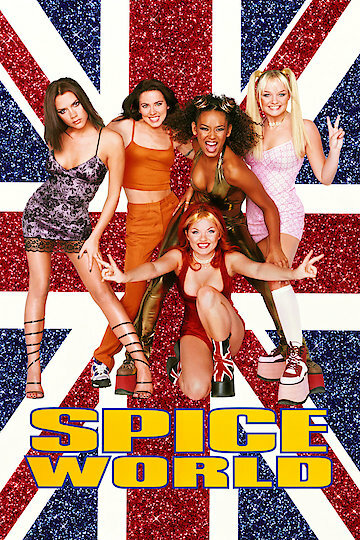 The film was directed by Bob Spiers and stars the girl group, the Spice Girls. This musical comedy is a fictional story leading up to a huge concert at London's Royal Albert Hall and includes dream sequences, flashbacks, surreal moments and funny asides. The moving is about the journey they make trying to get to a concert they must perform. It starts out with the girls performing for a small event and becoming super overwhelmed with all the burdens of fame. They decide they deserve a break and go to a party to meet an old friend who is about to have a baby. While at the party the friend goes into labor and they rush her to the hospital. During the movie the Spice Girls' manager is in the middle of a negotiation with two Hollywood producers who throw out different silly and outrageous plots for the girls to act out in a movie which leads them to act them out during the movie. In addition to the completely outrageous movie plots being acted out through out the movie, the girls are also being stalked by a camera man who has been sent to spy on them by a newspaper editor determined to destroy their career. During the movie the girls meet aliens, train at some sort of camp, and almost get blown up by a bomb. The girls also have some action packed sequences including jumping a draw bridge in a double decker bus. During the credits one of the Spice Girls addressed the audience and tells her fellow band members that they are being watched by an audience. The girls then begin to talk to the audience about different things in the film. The screen goes black when the aforementioned bomb goes off.